To create a new Logix, click on the Add... button. The Add Logix window will be displayed. The system name is required. The system name for a Logix always must begin with the two letters IX, usually followed by a number selected by the user. For example, valid Logix system names include: IX1, IX34, and IX100. All letters in a system name must be in upper case. If the user enters lower case letters, JMRI will automatically convert them to upper case. Also, as a convenience to the user, if the entered system name does not begin with IX, the program will add IX in front of what is entered. For example, to enter a system name of IX32, simply enter 32 in the system name field, and the program will do the rest. The user name is optional but recommended. A user name may be any useful text, provided the new user name was not previously assigned to another Logix. Once a Logix is created, its system name cannot be changed. Its user name may be changed in either the Logix Table or the Edit Logix window. The user name is usually used to identify the particular Logix, for example, "Signal 5 Control". After clicking Create new, the Logix will be created and the Edit Logix window will appear. Click on the Select menu on the right side of the desired Logix. The resulting menu has a number of options. Select Edit to open the Edit Logix window for the appropriate Conditional Editor based on the Options menu editor selection. For editor details, see the Conditional List Editor page or the Conditional Tree Editor page. Select Copy to duplicate an existing Logix. The Copy Logix window will be displayed. Enter the system and user names and click on Copy. An Input box will be displayed for each conditional in the orignal Logix. Change the name if desired and click on OK. If this conditional is not needed, click on Cancel. 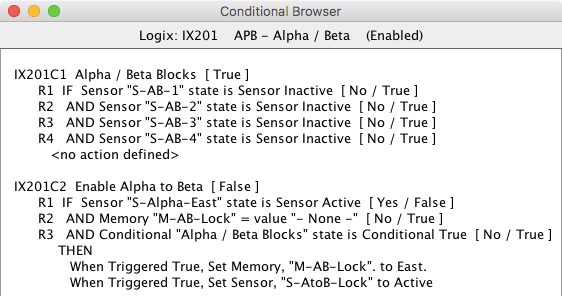 Select Delete to delete the selected Logix and all of its conditionals. A confirmation dialog will be displayed. For more information, consult the main Logix documentation.